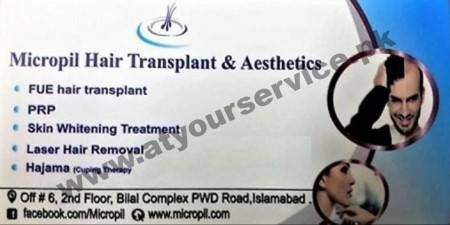 Micropil Hair Transplant and Laser Hair Removal (Micropil) is a renowned institution working since 2013 with more than 500 clients as per the most recent stats consolidated in January 2019. Micropil always focused on providing the best services to our clients. With the most talented and experienced faculty, we are aiming to be the top-rated medical institution in Pakistan for all kind of treatment of hair. Micropil has a team of well qualified and highly professional doctors and surgeons. The customer is the KING at our clinic and he/she gets the service accordingly. Our doctors have previously worked in top-rated institutions such as Maroof International etc. and with the latest technology available we are pretty much confident that we will maintain higher levels of providing medical services. Please see the Services Section on this page for details on the services we provide.